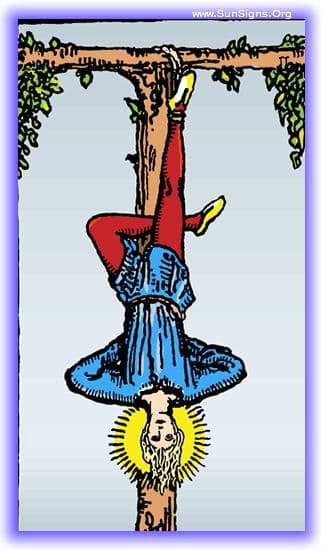 This tarot meditation of the hanged man card upright is about the power of patience and inaction, and the Hanged man shall be your guide. Place the blue cloth in front of you, with the blue candle at the top. Place your card upright on the cloth in front of you. As you slip into this meditation, feel a sense of calm come over you, the knowledge that you can proceed forward by not moving. You find yourself in a small room, with a door in front of you. You are sitting in a chair, and someone is standing in front of you, talking to you, charging you to action. A strange man with a blue tunic and grey pants stands by the door, unseen by the man talking to you. The man is most insistent that you must act, that you must do something about all this. Every time you open your mouth to respond, the man in the blue tunic puts his finger to his lips with a secret smile, and shakes his head. The person in front of you grows ever more furious, incensed at your lack of action. But still the man in blue cautions you against action. Eventually the man speaking to you grows frustrated, and begins pummeling you. The man in blue motions for you to cover your head, but to not respond. How can I not respond? This man is assaulting me! He yells, he screams, he kicks! How can I not respond to this behavior, to defend myself! But you trust the man in blue, and follow his instructions, and simply defend yourself. Eventually, the man grows disgusted, and storms out of the room, still not noticing the man in blue. He laughs brightly, and motions to you to join him, slipping through a secret side door. Behind this door is a hallway adjacent to the one outside, and you watch in silence as the man in blue follows along, looking out at your tormentor in the hallway. In the hallway you see that he is being berated by another for his treatment of you, and that you are to be set free from your restraints. Your inaction showed that you were innocent of whatever you were being attacked for. You had done nothing while others pointed and accused, and your inaction is what eventually showed your innocence. He looks at you, and smiles, telling you the secret of a situation current in your life that is affected by this. Do not act, he cautions, watch and you will understand why, listen and you will learn why. As you think over this tarot meditation of the Hanged man, mark down its details in your journal, think about the results over time. The action you may need to take right now may be no action at all.